Prince Gyalsey greeted PM Modi with folded hands. 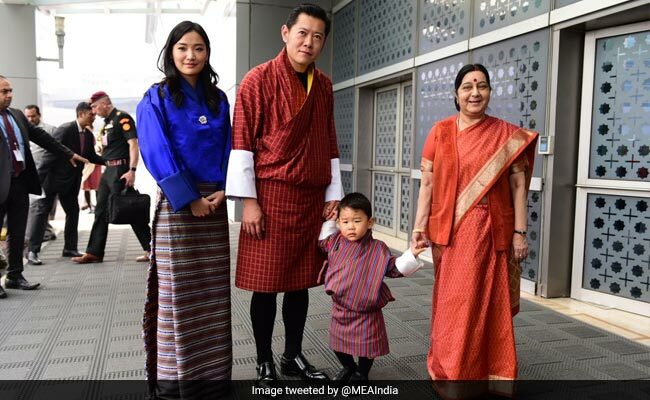 Bhutanese king Jigme Khesar Namgyel Wangchuck along with his wife Jetsun Pema Wangchuck and their son arrived in Delhi for a four-day visit to India, their first since India and China ended a 73-day-old standoff in Doklam plateau two months ago. 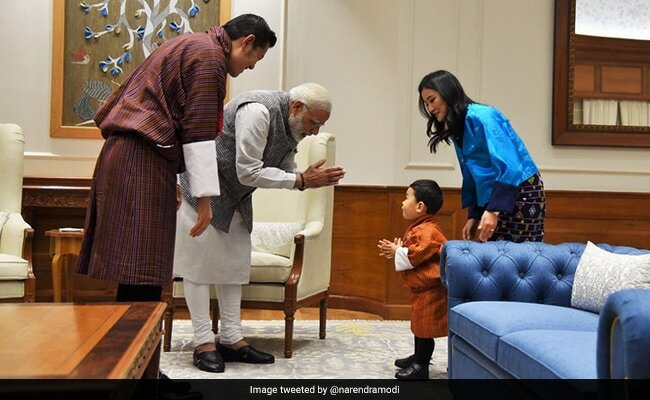 However, amid talks around the relationship between India and Bhutan and the golden jubilee celebrations of diplomatic ties between the two neighbours next year, it's the little prince, one-and-a-half-year-old Gyalsey, who has the spotlight on him. 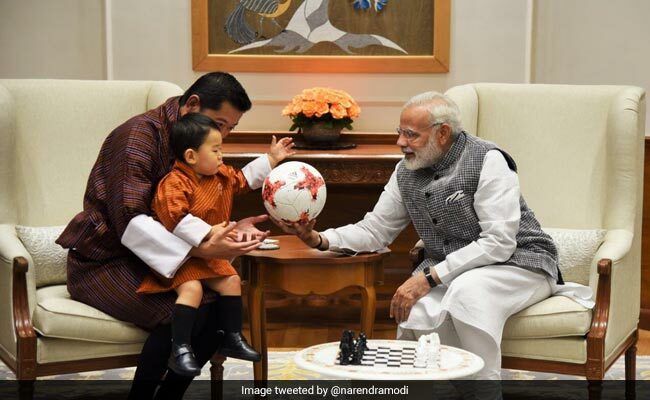 PM Modi wooed the prince with the official football from the FIFA U-17 World Cup. Prime Minister Narendra Modi yesterday met the royals where the prince greeted him with folded hands. The cute namaste moment made for a great frame. Later, when PM Modi sat down with the Bhutanese King for a tete-a-tete, Prince Gyalsey patiently waited. PM Modi then wooed him with the official football from the FIFA U-17 World Cup and a chess set, which the royal guest gladly accepted. President Ram Nath Kovind and wife Savita played the perfect hosts. 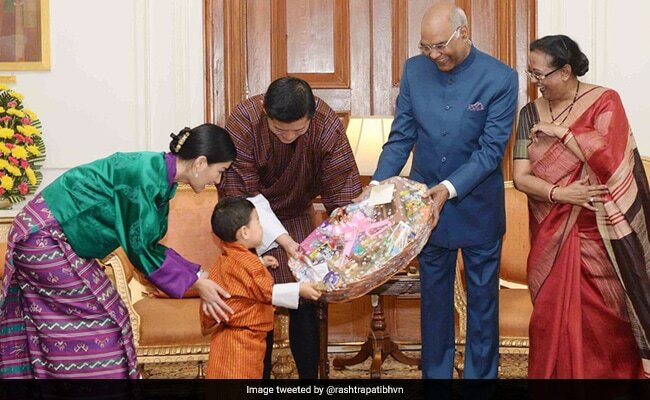 Earlier in the day, at the Rashtrapati Bhavan as President Ram Nath Kovind appreciated King Wangchuck's role in resolving the standoff between Indian and Chinese troops in the Doklam region of the Himalayan kingdom, his wife Savita Kovind couldn't take her eyes off the boy in gho, the traditional and national dress for men in Bhutan. When it was time to say ciao, he received a treat, a gift hamper about his size, from the president and obliged the photogs with a group pic. Sushma Swaraj received Bhutan's royal family at the Delhi airport. External Affairs Minister Sushma Swaraj, who had received the royal couple, dubbed the 'William and Kate of the Himalayas', at the Indira Gandhi International Airport in Delhi airport the previous day, had her share of fun with the prince of Bhutan. She was seen pulling his cheeks and trying to make small talk with him. Defence Minister Nirmala Sitharaman gifted traditional Indian toys to the prince. During their meeting with Defence Minister Nirmala Sitharaman, Prince Gyalsey got busy with traditional Indian toys. 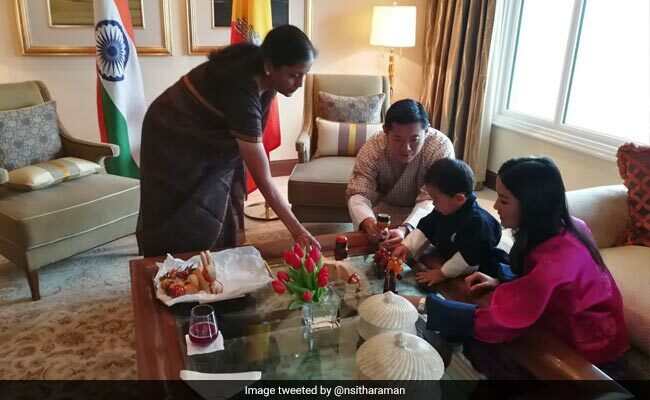 Ms Sitharaman tweeted, "With His Majesty the King, the Queen & the adorable young Prince of Bhutan. Happy to see HM the Prince like the Chennapatna (Karnataka)toys."